In October 1848, a cargo ship loaded with lumber and carrying several passengers left Racine, bound for Detroit. That evening the ship, commanded by Capt. Justin Bailey, encountered a violent storm. Buffeted by high winds and heavy rain, the ship pitched and rolled in the angry Lake Michigan waters. Concerned for his passengers and cargo, Bailey kept watch for a place in which to ride out the storm. Late that night he found a quiet cove where he could drop anchor until the storm passed and his journey could be resumed. That act of nature assured Capt. Justin Bailey a measure of immortality; the village that sprung up there the following year was called Baileys Harbor. Located on the shore of Lake Michigan, the area has thousands of acres of wetlands and wilderness, much of it preserved as part of Björklunden, Toft's Point and the Mud Lake Wildlife Area. 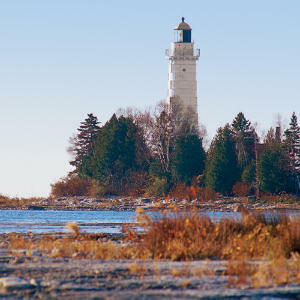 Birding and hiking are at their very best at the Ridges Sanctuary at Baileys Harbor. The Ridges, a privately held wildflower preserve, includes the Baileys Harbor Rangelight and Lighthouse, and a beautiful sand beach that's open to the public. The Baileys Harbor business district is situated on the lake and includes many fine shops, galleries and restaurants. Charter fishing boats leave here daily carrying anglers in search of a memorable day on Lake Michigan.